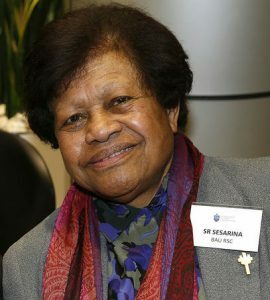 Sr Sesarina Bau supports the staff of the intensive care unit at St Vincent’s Hospital in Sydney, the patients and their families. When I was 15 in Fiji. In reality, I had a growing realisation that I had a calling. It was through prayers – I prayed so hard, especially with my mother – that I found I found the truth of my vocation. What I was I thought that at the end of my schooling, I wanted to do something about that calling. My aim always was to be a nurse. I didn’t want to leave school, get married and have kids. I wanted to be free to care for people for God. It was not easy to tell my family. I told my mother first. She was very happy for me, and helped me talk to my father. He came to terms with the idea quite quickly, but was most insistent that I stay in Fiji, not go to the missions. We all prayed as a family to support my vocation. What was the process like then to join the Sisters of Charity in 1956? I first went into the novitiate of our local Fijian order, the Sisters of Our Lady of Nazareth, when I was 18 in 1953. Then the local Bishop wanted some Sisters to come to Australia to study, so I came to study at the Convent of the Presentation Sisters in Windsor in Melbourne. It had been decided I was to be a teacher – that was always the intention of the Bishop for us to be teachers.. So I studied, worked, came to Sydney to St Vincent’s College, Pott’s Point. Still with the idea of being a teacher. But, I felt my calling was taking me in another direction – that of nursing. You were a teacher to start with? Was that something you were keen on pursuing? When I was at St Vincent’s College, I discerned that being a teaching Sister was not my vocation. My vocation was to be a nurse. I prayed about it for months, and talked to Sr Mary Sarto and later Sr Bernice at St Vincent’s Hospital about my desire to become a nurse. When it was agreed that I could change my path, I had to eventually go through Rome to also change congregations. In the meantime, I did go back to Fiji and my original order, where I combined teaching with nursing. How many joined with you, and how many are still in the Congregation? In 1968-70, I was in the novitiate of the Sisters of Charity. I waited for a long time, because I had made my final vows in the first order. Three others entered with me. I am the only one left. What is the major difference you see now in religious life compared with when you first entered? Religious life now is absolutely different. Before, it was very confined, very restricted. 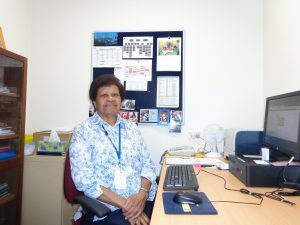 But I have found freedom in religious life that I would not have found in a more conventional life in Fiji. I have been able to serve God and the sick in different places across the world including the Solomons, East Timor., as a volunteer in a Red Cross run refugee camp in Thailand, Kampuchea. and here at St Vincent’s. When the Congregational Leader asks me where I would like to go next, I ask her to let me stay here until I go to Rookwood. As always, I just leave everything to God in prayer.